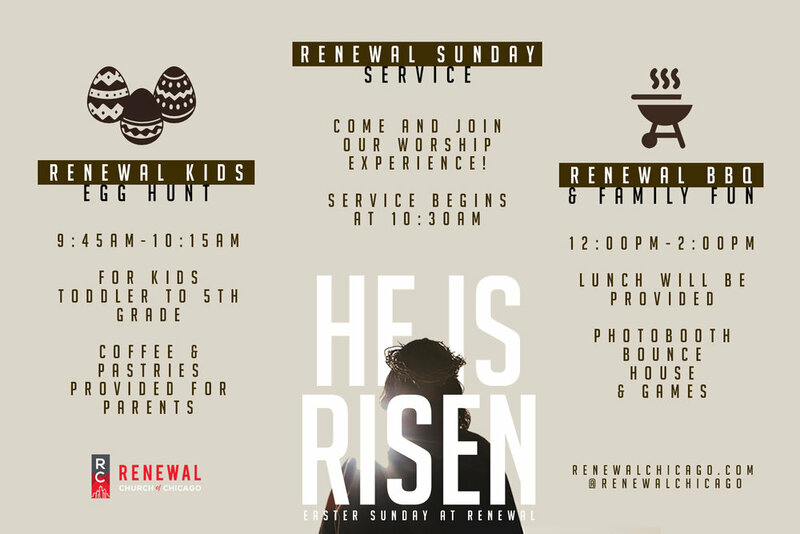 Join us for our Easter Sunday Service on April 21st at 10:30am. We hold our services at Wells High School located at 936 N Ashland Avenue, Chicago, IL. We'll have an Easter Egg Hunt from 9:45am-10:15am. We’ll have coffee and donuts available for our parents. Our service begins at 10:30am. During service we’ll have a few baptisms! If you’re interested in getting baptized and want to learn more please email Liz Carroll at info@renewalchicago.com. After service we'll have a BBQ + Fun and games! We hope to see you all there!